London Broncos chief executive Gus Mackay says they are in a strong position after agreeing a groundshare with Barnet FC at the Hive. The deal brought to an end months of uncertainty for the Super League club. Mackay told BBC London 94.9: "We now have the best structure to move forward that we haven't had before. "The next two years is about building that fan base and building the foundations to make the club bigger, better and stronger." The Broncos were in danger of going into administration after being without a home since leaving the Twickenham Stoop at the end of last season. 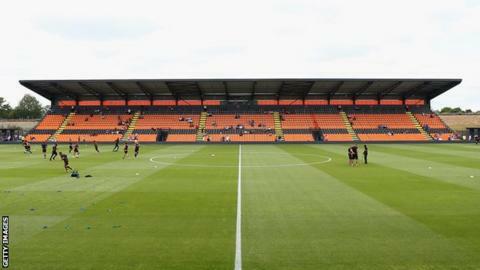 The two-year deal agreed with Barnet on Friday will see the Broncos play their home fixtures at The Hive, the non-league football club's 5,176-capacity stadium, and train at their former ground Underhill. "Friday was a big moment for us as a club but more importantly for rugby league in London to have got the deal over the line," Mackay added. "It has been a tough six or seven months but we have finally got there. The deal was probably dead more times than it was alive. "We have a venue that I think is probably the best we have had in London. I really see it as the club cementing its roots. "I firmly believe this is the right move and will lay the foundations for a long-term future for the game in London. "The governing body have been tremendous in their support to make sure we survived. "We have laid low for the last couple of months but are now in a position to ramp it up and move forward." Broncos saw 16 senior players leave during the off-season but Mackay is confident that head coach Tony Rea will be able to build "a competitive" side. Mackay revealed they had applied to the Rugby Football League for special dispensation to recruit more than the allowed quota of overseas players but permission had been declined. "There have been discussions over the past couple of weeks and Tony Rea has been working hard to put a side together," Mackay said. "Since Friday we are in the throes of getting contracts out there. "There are players on the market and you will have a side that will be hungry and players with points to prove. "Whilst we tried to get some dispensation we have not been successful. "Tony is assembling a team of the right players with the right calibre in the right environment to be able to deliver. It is a new era and a new dawn that we can move into."